This brochure makes finding the best SpecChem product for the job easy! These selection charts cover repair mortars, sealers, curing & sealing, sealers & densifiers, grouting & anchoring, epoxy and a cross reference chart. Click the link below to learn more. 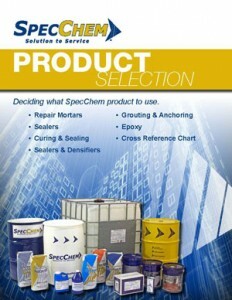 SpecChem’s Product Selection Brochure is a great tool to help you determine the right product for the job.